Curated by Georgia Bosson, for the The Creative Edit featuring UK designers including Georgia Bosson, Jenny Parker London, Cecily Vessey and many more. Cecily will have her Clerkenwell, London Skyline and Coal Drops Yard prints for sale. Cecily will be at Unit 4, The Carriage Way in Deptford Market Yard with her complete range of prints and homewares. It’s a double unit and in the other half is Cecily’s studio buddy, Georgia Bosson with her textiles, trays and other hand screen printed goodies. Saturday 8th, 10am - 6pm: Come and print a free sheet of wrapping paper with a ‘Georgia Bosson’ design. All days in between open by appointment. Please message info@cecilyvessey.com to make a booking. Saturday 15th, 10am - 6pm: A free sheet of hand printed wrapping paper with every purchase, so your Christmas gift is ready to go! Cecily’s drawings of Deptford are going back up on the window’s of the Taproom in Deptford. Earlier in the year she transformed the huge glass windows of The Taproom in Deptford Market Yard with bespoke artwork showing five individual scenes from around Deptford and her signature skyline. They are going back up, this time with a Christmas twist. The drawings are available as limited edition screen prints from the web shop. If you go and see the display on the Saturday 8th or Saturday 15th December you an visitC Cecily’s Christmas Pop - Up Shop at Unit 4, The Carriage Way which will have her full range of prints and homewares on display. As part of South East Makers Club for the London Design Festival Cecily is transforming the huge glass window front of The Taproom in Deptford Market Yard with bespoke artwork showing four individual scenes from around Deptford. Six Pop Up Shops each hosted by Crafty Fox Market Alumni including: Georgia Bosson, AndSmile, Mr Peebles, Custom Made, Hairy Jane and Luke Adam Hawker (image credit). All are welcome to our festive launch party on Friday 24th November from 6pm. Join us for drinks and nibbles, meet the makers and browse the stores selling a mix of ceramics, art prints and originals, textiles, jewellery and gifts. 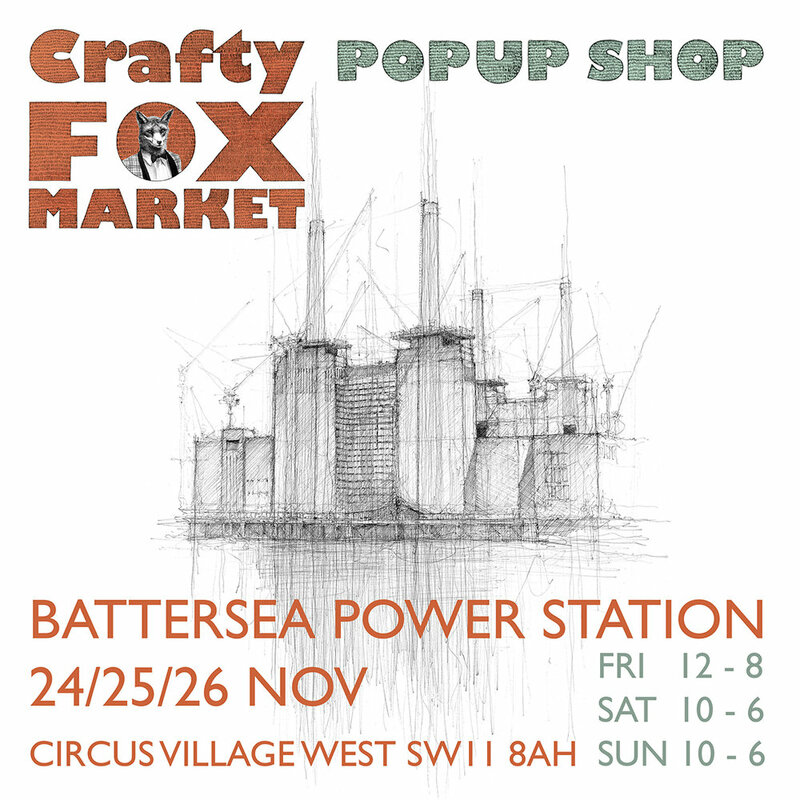 Who needs Black Friday when there's a crafty party happening and all with a wonderful view of the iconic Battersea Power Station. Viktorija from AndSmile will be there offering her amazing 10 minute portraits too! Cecily attended St Edward’s School, Oxford. In 2017 the school celebrates its 20th anniversary of becoming fully co-educational. This exhibition marks the occasion by bringing together six former pupils who are now forging careers as professional artists and artisans. These women all studied art during their time at the school, and it is a wonderful opportunity to see how their work has progressed and their practice has developed in the intervening years. The exhibition encompasses a broad range of styles, media and techniques: from Rose Barry’s egg-shell ceramics and Lâle Guralp’s highly detailed, intricate illustrations; to Rebecca Wilkes’ bold, statement floral jewellery, there’s a wealth of talent on display. Many of the artists draw inspiration from their surroundings: Miranda Stewart paints semi-abstract expressionistic landscapes and Harriet Blomefield’s drawings are inspired by urban architecture. Cecily will be exhibiting some original drawings of her favourite locations in Oxford and she has also created a limited edition screen print of the view of the St Edward’s School Quad/Chapel and Cloisters for the exhibition. Cecily's collaboration with Georgia Bosson 'Landmark Locations' is going on tour this year! First up is an exhibition at Festa Sul Prato in Deptford, London. There will be an opening evening on the 12th January at which there will be a dinner at 7pm to book a table please see the flyer. The exhibition will run until the 29th January. ‘Landmark Locations’ An exhibition of limited edition screen prints depicting UK Landmarks by Cecily Vessey and textile designer Georgia Bosson. STUDIO KLUBO: This is how we do it. Studio Klubo is back with a summer show. Cecily Vessey, Georgia Bosson and Alice Tams will be at Craft Central for a week showcasing new works and work in progress as well as selling their current ranges. Each day one of the artists will be in the shop creating live art and will be available to answer any questions that you have. Live Art Schedule: Come along to see how we do it!